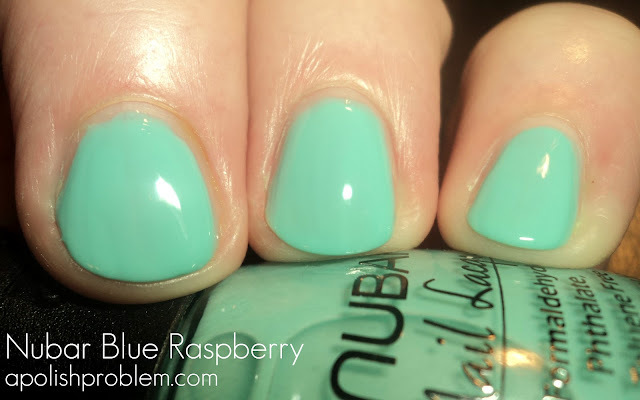 No, you aren't having a case of deja vu, I did indeed previously review the Nubar Jellybeans collection. 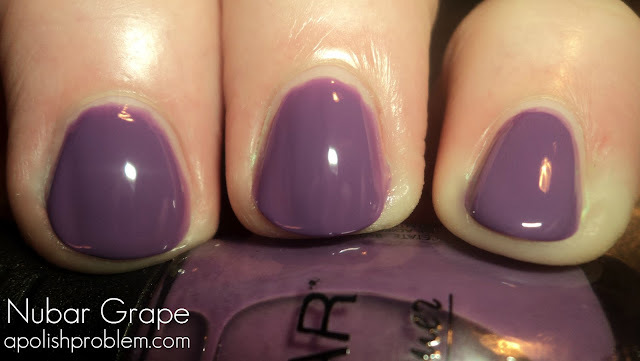 However, recently I discovered that one of my pictures from that review, the one for Nubar Blueberry, had been stolen, linked back to this blog, and was being bashed because of my nail shape on a Russian LiveJournal group. I had wondered why my traffic for that particular post had jumped from approximately 200 views to 1000+ views in a matter of days. Well... that was why. :( I have since removed that post because it was being linked on the LiveJournal group. At first I was going to ignore it. No, at first I was going to close my blog and hide in my closet, but I quickly decided that was not the best course of action. So, I then decided to ignore it. Then I made the mistake of checking all of my traffic for the past year and I discovered that this was not the first occurrence of this happening. I found where my blog had been linked on several international forums with the comments "horrible nail shape", "nasty nails", "disgusting", etc... always accompanying the posts. As you may know from my previous post regarding my nail shape, my skin is not thick, and I honestly don't know of anyone that likes to read negative comments about themselves. But at that point, I figured I could no longer ignore it. I could be upset and I could be heartbroken, and I could be mad (all of which I was), and then I decided to look at the comments constructively, even if that was not their intent. You see, I am always trying to grow as a blogger. From my very first post, until now, 3+ years later, I feel that I have grown by leaps and bounds. However, that's not to say that there isn't room for improvement. I feel that you should never settle. Your next post should always try and be better than your previous post. With that idea in mind, I took a long hard look at my nails through a constructive eye and decided, that yes... I could better my nails and my pictures. So I took my glass file and proceeded to rethink the shape of my nails. I was able to thin out the flare on the sides and really taper them in. Now, they aren't perfect, but I really do see an improvement. Blue Raspberry - light aqua. I love this color. It's so pretty, and one of my favorites for spring this year. 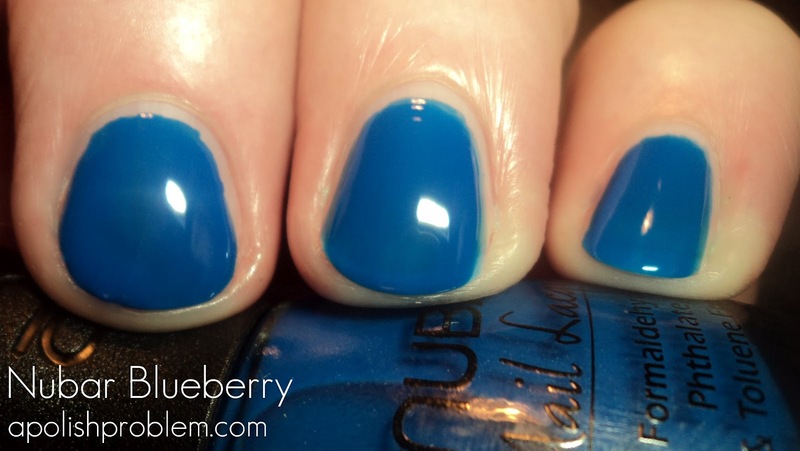 Like I mentioned with Zoya Wednesday, a similar color, it reminds me of sea glass. As I was applying this one, it really reminded me of RBL Bikini Bottom, though I no longer have that one to compare. This one had one of the better applications in the collection. 3 coats. Blueberry - Blueberry - bright royal blue. I don't own Revlon Royal, but judging on pictures, it seems very similar, only this one has a jelly-like finish. I loved the color, and this go-around, the formula was much easier to work with. 3 coats. Cherry - bright red. Previously, I didn't like this one my skin. However, I loved it this time. It does have a bit of orange in it, but not as much as I previously thought. 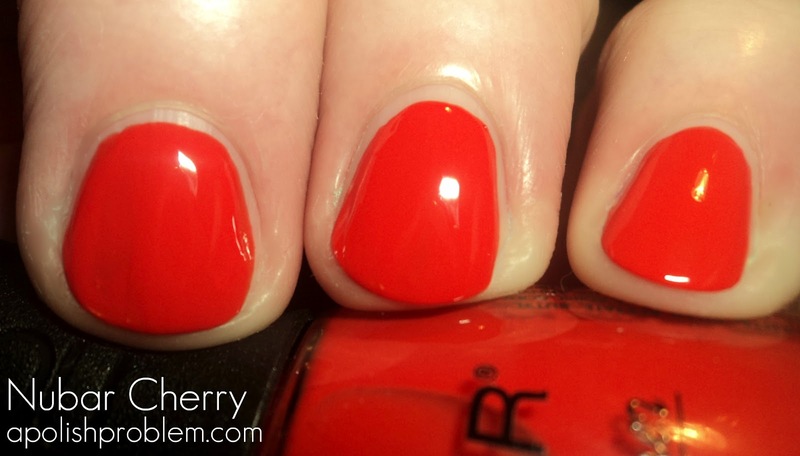 his one had the thickest formula and it took me less coats to reach opacity. 2 coats. Grape - Dusty medium purple. This purple is quite nice, and it does have a bit of dustiness to it, like Julep Charlotte or RBL Purple Haze, though I think it's no wear near as dusty as Purple Haze. I didn't really like the formula on this one. I kept having an issue with it leveling. Hence, the bumpiness. And though it's one of the darker colors, it was also one of the sheerest and took me a few more coats to reach opacity. 4 coats. Kiwi - light lime green. I'm calling this a lime, but it's more of a mix between a light spring green, mint green, and lime green. I kept waffling on my color description, so I just gave up and called it "lime". LOL. I did get a slight case of red-hands with this one. This one was sheer, but easy to work with. Like Grape, I did have an issue with the leveling. 4 coats. Lemon - daffodil yellow. This one is brighter than a pale yellow, but it's not a neon. It's also not a medium yellow, such as China Glaze Happy Go Lucky. The formula is thinner, but if you go slow and watch your strokes, it shouldn't be an issue. Now that I've had a chance to revisit it, this one is probably tied with Blue Raspberry as my favorite of the collection. 4 coats. Strawberry - light pink creme. This one is very candy-like both in it's color and it's finish. I really does remind me of strawberry candy. It did take a few coats to reach opacity, but the formula on this one was very nice, so it wasn't an issue. 4 coats. Toasted Marshmallow - light brown. In my previous post, I erroneously called this one "Toasted Coconut". In the bottle, this brown leans slightly pink, though I didn't really see that on my nails. The formula was like that of Strawberry and Kiwi. 4 coats. I still like this collection, probably even more so, now that I've had a chance to re-review it. The jelly-like finish can be a bit hard to deal with, but nothing that would make me say not to purchase these if there was a color you were lemming (like say Blue Raspberry. LOL). Again, this collection is now available at bynubar.com (as well as other outlets). Nubars retail for $8 per bottle. Wow, all of these are really wonderful. I'm particularly fond of Blue Raspberry and Strawberry. Lovely. I love Nubar and I love jellies but I have read too much about streak issues with these so I'll pass. As for those horrid people? Your photo quality is absolutely excellent. I can completely see the colour and the finish and they are excellent photos for helping me decide whether I like a polish enough to buy it. Your text is fully informative. You care for your skin and you apply your polish with great care. Don't listen to them. They know nothing. I've always enjoyed your blog and it has got more and more professional. I had a hiatus from blog-reading and I can see the difference because you DO take this seriously and show us quality work. Thank you. how does it compare to products like D. G? I like the nubar kiwi!! Great swatches! Do you think any of these polishes would work in glitter sandwiches? I've just discovered your blog and I'm loving all the pictures. I'm so hurt for you by those horrible people. I'm glad that you obviously have more class than they do! I agree with jaljen. Your photo quality is perfection and I really choose alot of my polishes from reading your blog and staring at the swatches. Your nails were great then and now. Keep growing. I've been following you have grown as a blogger. I can't wait till your next. Hope you like them... I think they are fantastic for glitter sandwiches. People are disgusting sometimes, especially when they can hide behind their computer. I think you are doing awesome for taking the negative BS and turing it into something more positive. Don't let them get you down, your blog is great and your swatches are awesome! 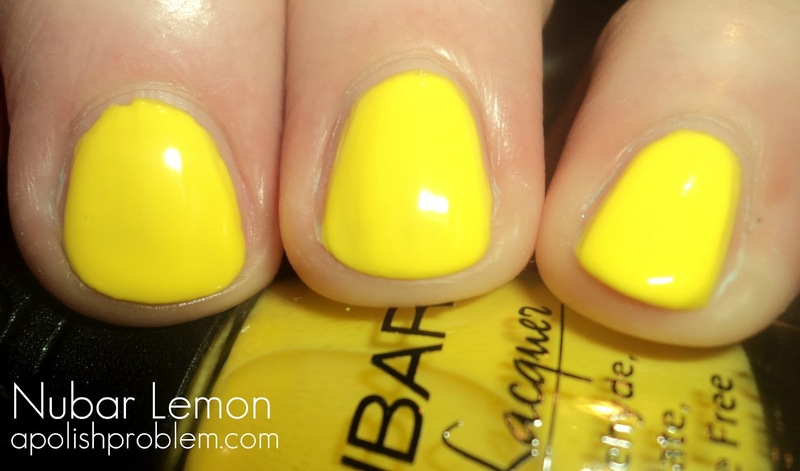 I love these Nubars too, I need to get these polishes. They look so squishy and pretty. I am really glad you didn't let them get to you to the point of closing up your blog. There are always going to be nasty mean spiteful people in the world and every one of us has something that others don't like-but it's how you hold your head up high and continue to do quality work like you have been and try not to let them get to you. I appreciate that you tried to reshape your nails-but in all reality everyone has different shaped nails-you can't file yours to all of a sudden be something that these a**holes will all of a sudden appreciate and love. You will NEVER make them happy so all you can do is ignore the haters because you have plenty of people who love you and your blog. Stop looking at the mean messages and looking for the mean messages. you will only hurt yourself more. Ignore them-they are nothing. Yup, mean people are everywhere. It really chaps my hide. I'm glad that you're sticking around and putting a positive spin on it. It's hard to be the bigger person, but you do it with such grace! Yay you! I still need to email you! It's been such a crazy week! I picked up a horrible stomach bug, and have been involved with the local school board in an effort to develop a program to help solve the bullying epidemic in our schools. It's exhausting! Still want to chat with you though!! I can be reached at kimberslacquerkorner@gmail.com if you get a minute before I do! I'd love to hear about Amelia's appt the other day! I've been thinking of her! I really liked your nails - always have. But if you're really into wanting to have them shaped (and trained into a shape), go to a salon once and have a professional manicure. I do it about once a month to shape my nails and it makes a big difference. Love you! I've gotten manicures before, years ago when by twins were babies, and I think my tech was just a meanie because it wasn't an enjoyable experience. LOL. I've thought about getting them to keep my cuticles in check, but unfortunately right now, it's just an expense I can't justify (stupid debt reduction plan). Though, I know Groupon often has manicure deals, so maybe one day I can splurge. I really don't want to make my nails perfectly straight, I mean, I can't completely change my nail shape to please other people. Plus, they wouldn't be MY nails. The main reason I tapered them in was because I looked at my pictures through an objective eye and realized that I wasn't completely satisfied with them. My review of this collection, in particular, bugged me. I blame watching "Smash" at the time. LOL. My nails are always going to be flat, short, slightly curved at the top and flared out (though slightly less than before :P). I completely understand, and trust me... at this point, I am done reading (and, um, maybe seeking out) nasty, and hurtful things. Honestly, I tapered my nails in a bit because I realized that I wasn't completely happy with the shape. My nail shape is something I've struggled with since I gave up glue-ons. I had tried angling them in the past, but I could never get it to look much different. Then I realized I could go at a sharper angle, closer to my cuticle and they would look less flared. Now, I am much more satisfied with them myself. If anyone is now complaining about my nails then that's on them. I'm not going to stop blogging and I'm not going to completely change (how would I even begin) to change a handful of people. It's been a crazy week, hasn't it. :) I'm so sorry you've been under the weather. Good for you for going to the school board. Bullying in general makes me sick, and I am so sorry that your little one is having to go through it. Amelia's appointment went well. We still don't have an answer to her exhaustion, but a change in the time we give her meds has helped. We have our first appointment with the psychologist in 2 weeks. At this point, I waffle between Asperger's and no Asperger's, but we still need to figure out the cause of her anger and meltdowns. This collection is GREAT!!! and Im sorry you had to run into mean people... people are just assholes sometimes! I follow your blog, not ONLY because it great, but I admire that fact that you do have SHORT nails! (I do too) your reviews are amazing as are your nails!